A visual diagram of how the FRP panels work to prevent clogging on hoppers. Conveying coal from stockpile to boiler during winter months is a well-documented nightmare for plant operators. Identical conveying problems exist within the mining industry as coal is moved around the mine site. Coal stored outdoors on the stockpile or delivered by unit train or barges picks up moisture from rain and snow. When this wet or frozen coal is conveyed, it inevitably comes into contact with the plate steel of the various hoppers and chutes within the coal handling system. During winter, this plate steel is below freezing for extended periods. When wet or frozen coal encounters steel at sub freezing temperatures an instantaneous bond is formed. This bond causes immediate and often catastrophic blockage of the hopper and chutes. The bond and resultant blockage are so severe that often pneumatic drilling equipment and explosives are required to free up the system. This problem, known as FLASH FREEZING, is extremely inconvenient and very costly. 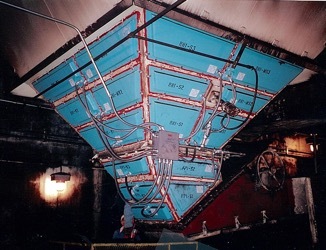 Several cases are documented where utility and industrial boilers have been shut down due to blocked conveying systems. The Hotfoil FRP heating panel specifically address the flash freezing problem.